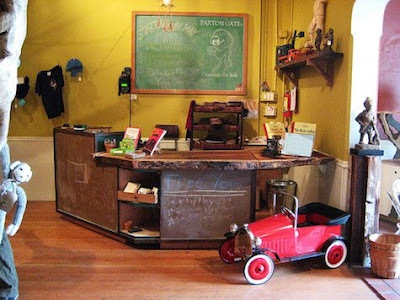 In fact, I might even go as far as to say this store (and this is odd, I realize, as it is just a store after all) pretty much represents how I want my girlie’s childhoods to feel... all magic and whimsy and interesting discoveries. Will they think them magical? Filled with unusual, interesting, experiences? Will they think they had enough time to play, to let their imaginations run for hours at a time, uninterrupted by the necessary (in an adult’s world) tasks of life? Or will they just remember that we seemed to be perpetually late… to everything? Lynne recently posted a link to this excellent Time Magazine article about parenting, reiterating the (immense) importance of play in our kiddos over scheduled, over-anxiety ridden little lives. Reading it was a good reset for me…a reminder of how I want to parent + (equally important) what I want to avoid. I’m thinking I’m going to dub 2010 the year of mellow parenting. I want to bring the magic back for my girls. 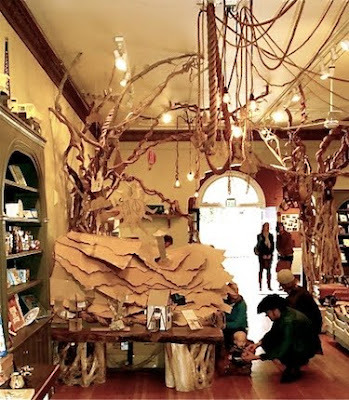 I have visited this SF store on line a few months ago and was taken with the cardboard/layered playhouse. I felt inspired to do more interesting, time honored projects with my sweet grandbaby Eleanor. You are right to want to let your daughter's imaginations run free... what a gift you would be giving them. It is the antidote for an over scheduled life. Joslyn, you have parented your girlies in a deliberately creative and nurturing environment for years now... what you are planning on doing in 2010 is really more of the same great stuff. i've been to the store and it is wildly wonderful. i can relate to what you write about...the rush of life can sometimes interrupt the creative flow...a constant struggle to find the balance. thanks for inspiring. cheers. here's to mellow parenting! I've always thought that I had plenty of play time growing up and that it helped me to develop a healthy imagination. One thing I would do differently as a parent, is play WITH my children and introduce them to as many places and experiences as I could. I often felt isolated from my parents and I hope to have a closer relationship with my children if I ever have any. Love this post and thanks for the link to the article. I just read the Time article on parenting and really appreciated the perspective! I try to remember that childhood should be about joy. Enabling that opportunity is the tricky bit. I've got that magazine sitting at home and I've been avoiding it. Thinking it might stress me out. Now I think it's time to read it. I think about those same hopes for my daughter. Time to daydream, discover, create. How do we allow time and freedom and space for that? Would also love to focus on that. Thanks for bringing it up. The store is close to my apartment and indeed is magical! Beauty and imagination personified! Love your post! I feel exactly the same way and your idea of "mellow parenting" for 2010 is a wonderful idea! i have been reading your blog awhile now and love it, but this post is hands-down the one that has inspired me the most! i couldn't agree more that it's so important to be intentional in creating opportunities and environments for children to imagine... and just be kids. thanks so much! Love that store. Love this post. And the important reminder. Mellow parenting, I like that! BTW, I mentioned you in a little interview I did with ohdeedoh that posted today... I hope you like what I say! I have been pondering simplifying the holidays, too. I posted about it, if you are interested in more thoughts on the subject. I really enjoyed the TIME article as well. oooh patricia i just read it. you are too nice...i'm blushing. Joslyn - I am sure you are an awesome, magical mother. Looking at the snapshots of the moments you facilitate that you periodically post - your girls are so lucky. I wish I knew you in real life because I know I would be totally inspired! I'm right with you on the mellow parenting! 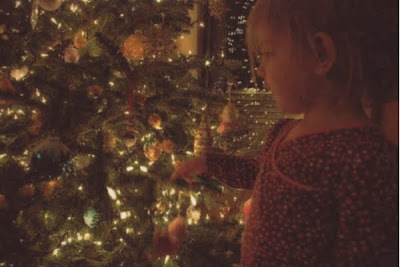 I think there's a great deal of value in children discovering things for themselves. Thanks for the reminder of the importance and magic of independent thought!